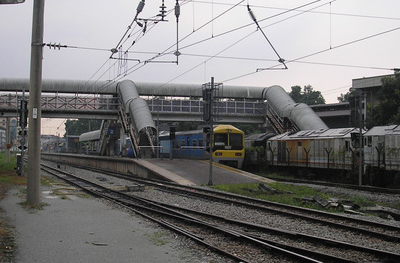 The Sentul Komuter station is a Malaysian commuter train station formerly known as Sentul railway station and is located in the east side of and named after Sentul, Kuala Lumpur. The station forms part of Sentul-Port Klang KTM Komuter train services, and is the northern terminus of the service. 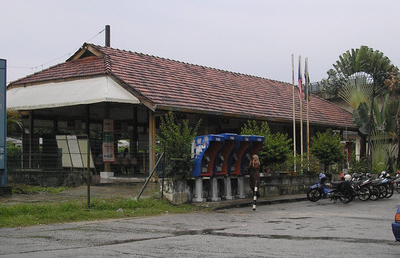 The station is located at the end of Jalan Perhentian, off Jalan Ipoh. The station is situated a distance away from two elevated Ampang Line stations which share similar names as the town of Sentul and the Komuter station, and serve the same locality. The Sentul Komuter station is located 730 m southwest from the Sentul Timur LRT Station, and 900 m northwest from the Sentul LRT station, which is located in the southern area of Sentul. Here's the our members favorite photos of "Railway Stations near Sentul". Upload your photo of Sentul Komuter Station!